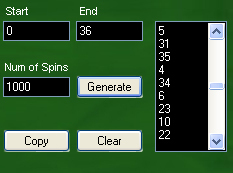 This function will Generate a desired number of Random spins that will be used when simulating a system that has been set up in Roulette Strategy Builder. If you for example have tested out a system on 500 spins and got a profitable result from this, you can generate 500 new random spins to confirm that the system will turn out well again etc. Here you will be able to register spins that occur in reality from a Real Casino or an online casino. By doing this you can build your own spin database from your favourite casino and use this database for your simulations when testing systems. If you for example have created 2 spin databases and want to have all these spins in one database when simulating your systems, you will be able to just browse these 2 files and Save/ Append them as one database. All sections including a chosen single number are possible to have these settings for and ofcourse also combine as many of them as desired. Then the strategy will only start if the first section and if not any number between 1- 18 has come up for 5 spins in a Row. A system is often built using sequences where you for example in sequence 1 will bet 1 $ on red and in sequence 2 bet 2 $ on red if black came up in sequence 1. Often you will Restart from sequence 1 if you had a win on that spin. In this case if Red came up on the first spin you will have the choice to either restart the strategy from sequence 1 or continue to sequence 2 anyway by choosing Yes or No. 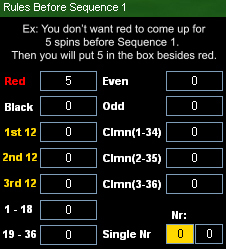 * This setting could be important for roulette systems that always need to run all sequences regardless if you had a win or a loss for that spin. When you have found a system or a combined systems that is turning out with profit, you will be able to run this system on Autopilot. Roulette Optimizer also have built - in systems that you just can enable for Autopilot and start betting on. You will be able to input rules for your playing. For example if you will not play for more than 10 minutes at the same table, you have the possibility to set a timer for this. Roulette Optimizer has set recommended default settings but they are possible to change as needed. When simulating a system or a combined system, you will have a detailed Report that includes a progress graph that shows you how this system went. The report also includes how many times each number and section has come up and what the balance was after each spin etc. You are building your systems and strategies by just placing out bets on a table as you are used to do by left and right clicking out your bets.